The narrow stairway is going steeply down into the insides of an old house in the Castle Hill in Budapest. The thick smell of mold in the air presses against my face when I carefully ascend the wooden, creaking stairs. These walls around me are so old that they would have a hundred stories to tell about what has happened inside the stone halls during the centuries. It has served as a shelter and hospital during the World War II, and during the Turkish era it was used mainly for military purposes, but some part of it also as a harem. Today my friend and I are going under the ground of the Castle Hill to this labyrinth with colorful, yet a dark history, which in the 15th century held its most famous prisoner; Vlad Tepes, better known as “Vlad the Impaler” – the paragon of Count Dracula. The labyrinth is a part of a complex series of caves and cellars beneath the Castle Hill and is about six miles long in total. The part which we can visit today is only a one mile long, though it felt like much longer. The entrance to the “Labirintus” was a bit hard to find, and it eventually was a little doorway behind one corner on the Castle Hill. 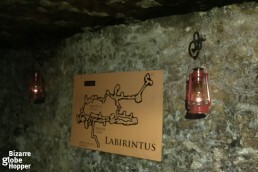 The "map" of the Buda Labyrinth. 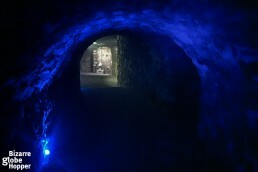 A cave hallway inside the Buda Labyrinth. When I managed to mentally get past the play created by the human-sized puppet scenes built around the place, the general atmosphere was quite intense. The corridors were narrow, the sound of the water dripping from the ceilings was everywhere, and the mental pressure created by the sheer nature of the labyrinth cast an intrigued feeling. I would have left the puppet scenes out. The labyrinth was very sparsely illuminated, and the signs showing the right way were few. The labyrinth has a ghostly atmosphere and the thought “what if I get lost?” did occur to me a few times. For children, this place may be a bit scary, but in a good way. However, I would’ve just loved this place as a kid. The air was thin and pressing, and the little lights cast dubious shadows around the corners. I caught myself looking in the dark corners a bit more carefully, as I tried to tune myself to see beyond the shadows in my ghost hunting quest. But I had no luck, unfortunately. There were also short stretches of corridors totally dark, so I grabbed my cell phone to cast some light on my path. However, if you don’t have any light, take walking in the total darkness as an adventure, but step carefully. Spooky installations in the depths of the labyrinth of Dracula. There are several legends about this labyrinth. But maybe the most interesting one is the one including Vlad Tepes. He was betrayed by the Hungarian King Matthias, who was supposed to be Vlad’s ally in his task to protect the Christian Europe from the Ottomans. 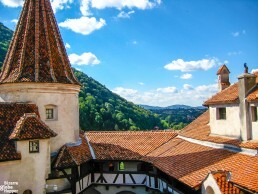 But King Matthias was conspiring with the Turks and abducted and imprisoned Vlad Tepes in the depths of the Castle Hill. It’s uncertain how many years Vlad Tepes was captured in here, varying from a few years to more than ten. Also uncertain is, whether Vlad was tortured here or not, but after his release, he eventually became the impaling and torturing monster of which history reckons him. Another legend tells that Vlad Tepes died here and that his body is buried in the Buda Labyrinth, but his head elsewhere. 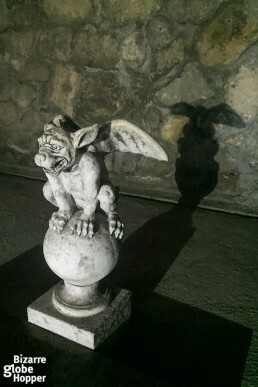 So, who knows, maybe under the stone placard where the carving says: “Dracula,” actually rests Vlad the Impaler, guarded by the little Gargoyle. There are at least five different legends about Vlad the Impaler’s death. However, the actual location of his grave is still unknown. The site said to be his final resting place on an island monastery of Snagov, just outside of Bucharest, houses no human body, only bones of horses. In the 19th century a ghost named as the “Black Count” reportedly haunted the labyrinth, so maybe there is the connection to Vlad Tepes? Then again, the “Black Count” can also be the spirit of an impoverished count from the 1800s who lived in Budapest and was an ally of bandits, allowing them to hide in the labyrinth for money. A little gargoyle at the "grave of Dracula". What if Vlad Tepes/Dracula really is buried here? 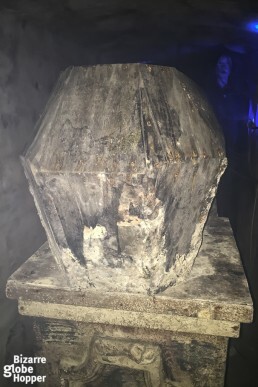 A mysterious coffin in the labyrinth. 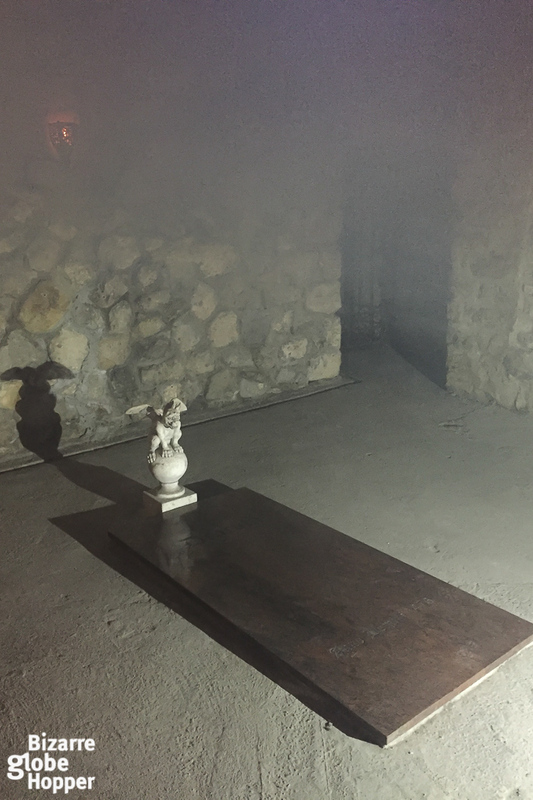 The "grave of Vlad Tepes, a.k.a Dracula" in the Buda Labyrinth. Arched cave hallways inside the Buda Labyrinth under the Castle Hill in Budapest. Dive into the depths of Buda Labyrinth with us, if you dare! There are also sections in the labyrinth that are restricted nowadays. Like a “world shrine” in one cave and a vine-covered fountain, that flows with wine in another. Why the wine flows endlessly in this “Wine Fountain of Mátyás” and why it even exists is a mystery. 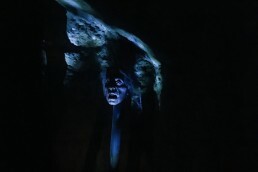 And even deeper in the labyrinth there are also stone humanoid statues, the most famous one of them is known as the “Shaman of Two Faces.” Are these artifacts extremely strange, or what? Unfortunately, the sections which hold i.e. the fountain and the humanoid statues are closed to the public. Why? We don’t know. What we do know is, that there was a sudden closure of the labyrinth in the late summer in 2011 when the police reportedly stormed the caves and evacuated the labyrinth without any explanations, why. Had they found something harrowing in its depths? And if so, what exactly had they found? If some people know, they haven’t told a thing. Also, the whole staff of the labyrinth was replaced after this sudden closure. Very mysterious, I’d say. 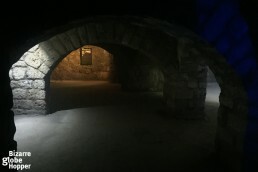 Since then the caves have been open to the public again but as a very restricted version. 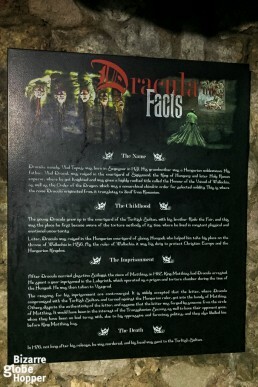 Facts about Dracula inside the Labrintus. 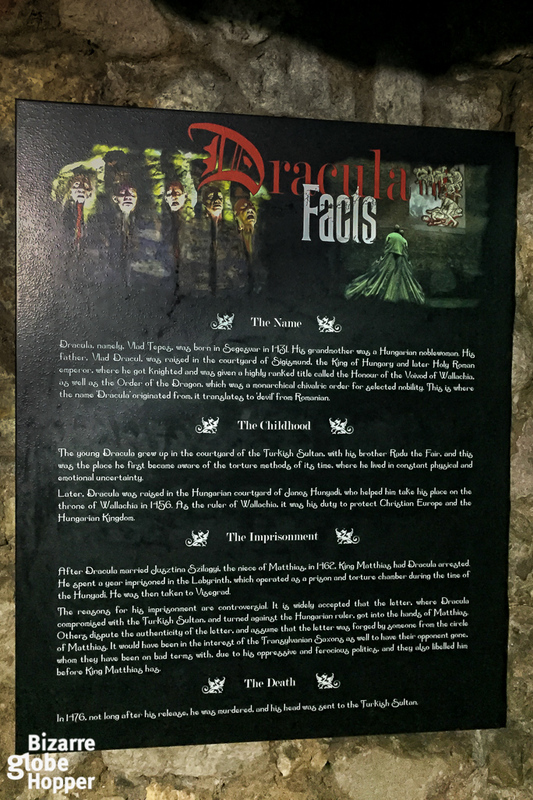 The tale of Vlad Tepes, "Vlad the Impaler", in the Buda Labyrinth. Although Vlad Tepes was a prisoner here only for a short time, his legacy has been capitalized in full. But I still felt tingling to see his actual cell in the depths of the labyrinth. And then, on the other hand, the “Coffin of Dracula” or the “grave of Dracula” were a bit too much for me. 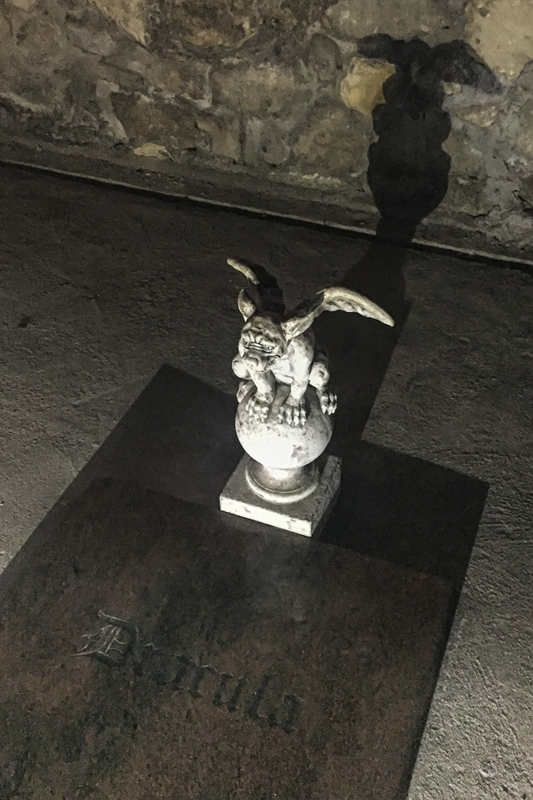 But I liked the little, white Gargoyle statue guarding his “grave” – it looked just ghoulish enough for the greatest Vampire Count of all time. 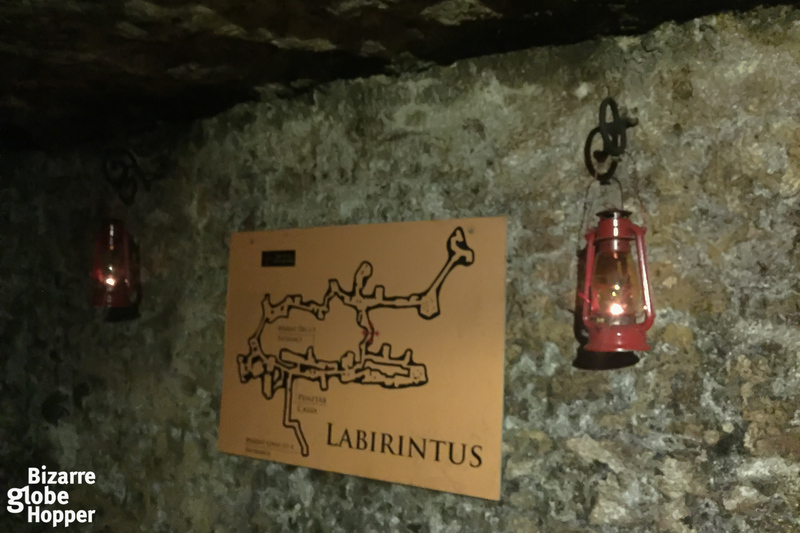 The labyrinth is an entertaining way to spend a few hours beneath the ground of Budapest and a little lesson in history on the side. Also, now and then, I couldn’t help of thinking is the labyrinth haunted? With so many centuries behind it, I’d be surprised if it wasn’t. I didn’t see anything, but I did walk through a couple of suddenly cold spots during my wandering in the labyrinth. But then they were gone as quickly as they had emerged. Strange, isn’t it?! However entertaining this visit was to the Buda Labyrinth, I still have to admit that when we ascended the creaky stairs back to the ground level, and into the daylight, I was thrilled to breathe clean air again. And all the mold, dampness, and ghosts down below stayed behind. Challenge your stamina by soaking in the outdoor pools of Szechenyi Baths on a freezing winter day. Steaming, thermal water invites you to enjoy the massaging whirlpools while snowflakes land on your bare skin. 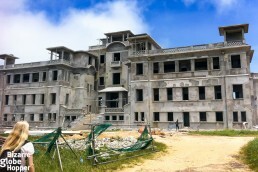 Bokor Hill Station in Cambodia has an intriguing history. It’s been a casino and a stronghold of Khmer Rouge. And locals say it’s haunted. 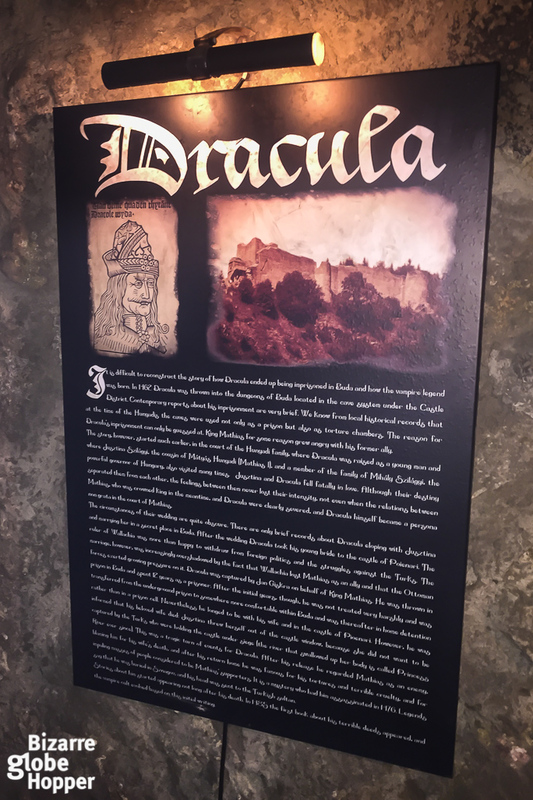 The Bran Castle, best known as the ”Castle of Dracula” near the Carpathian Mountains in Romania is full of history and traditional lore. I am from Romania and I’ve actually learned some things from your post about Vlad the Impaler. I was not a great history student while in school, I have to admit, and I didn’t know that his body is actually not at Snagov Monastery. Next time I find myself in Budapest I’ll make sure to visit the Labyrinth too. Thank you so much! 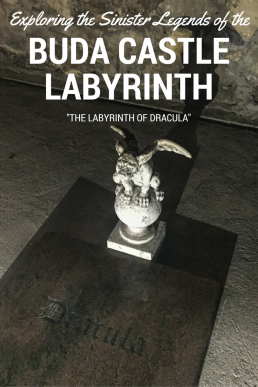 Let me know what you thought about the Labyrinth, if you go there someday! And yeah, the mystery of his exact burial place is really intriguing. Who knows if it really is in the Labyrinth?! Oh I have never thought to go here – definitely adding it to my list! I get nervous about creaky stairs too!! I’ve always been intrigued by Vlad Tepes story! Never knew that you could visit this labyrinth, but I’ll remember that when we visit Hungary. I would love to visit the Wine Fountain of Mátyás, that’s something we never saw! Too bad it is restricted to the public now. Yeah, me too, he was such an unconventional character and the fact that so much mystery surrounds even his death is so interesting. I was a bit disappointed, too, that a big part of the labyrinth is closed to the public, but maybe someday it’ll be open again. I hope! Looks spooky! I am a bit claustrophobic so it would probably take a lot for me to go down there, but it definitely seems like an interesting place. I love that kind of history so I would most likely find a way! Thank you so much for sharing this- my guess is that most people haven’t heard of this place before. I’m sure you could find a way and go there! It wasn’t so cramped place, after all. Yeah, many people don’t know that a part of the labyrinth is open again. Most of it is still permanently closed, though. For “unknown reasons”, which is very interesting, if you ask me. 😉 We also love all mystic and unusual places, so we’re always trying to find some in a new city/country we visit. This is such a fascinating post. Thank you for showing me a virtually unknown facet of Budapest. 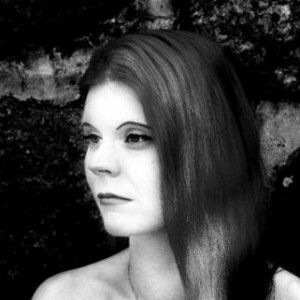 I simply love your writing style…it took me to an era that brought shivers down my spine. Keep writing. Looking forward to many such posts from you.